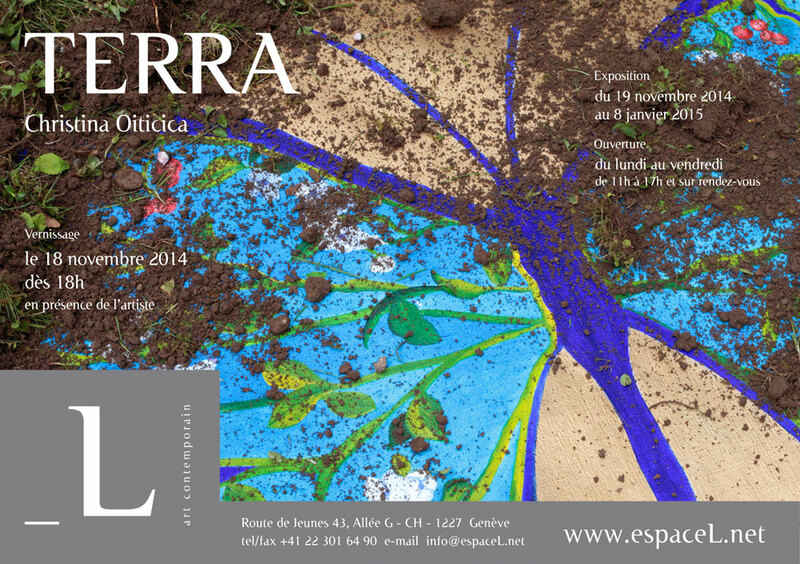 Opening: November 18th, 2014 from 6pm in presence of the artist. The studio is the space in which the artist remains, where he establishes its own rules and builds a routine and a method of work. To leave the studio and stay outside to observe nature, its effects on her artistic work: this was the choice of the artist Christina Oiticica to question her relationship with the landscape and the history of places where she buries her works. Since 2002, Christina intervenes directly in nature, earth, "foster mother", a symbol of femininity and fertility, gradually incorporating organic elements in her paintings, such as the leaves that promptly invite themselves to the act of creation; reflecting a particular moment, fruitful, full of singular energy, making the connection between the plastic and the organic materials. Earth, mud, the tree and the female body are also ubiquitous elements and symbols in the work of the Latin American artist Ana Mendieta, who portrays her fascination towards religion, rituals and myths leaving the impressions of her own body in the area where she performs. As land art artist Richard Long’s work, nature is both the substance and the medium of expression of Christina Oiticica’s work, performing soft and intimate changes in the environment, moving materials without sudden intervention, quite often by hand, giving her work a landscape and a human dimension. The canvases, buried by the artist in selected areas and naturally bound, carry out the history and geography of these places, its personal and collective history, with the inseparable marks and footprints of each element of the ecosystem. Christina incorporates in her works the symbols of love, the endless cycle of the seasons of nature and life, as well as the presence of the inseparable substance of the fabric, unlike the artist Michel Blazy. He chooses to display the degeneration of the organic material, submitted to the observation of the ephemeral. Both, however, are part of life confirmation through the artistic experience, a work in progress synonymous of the sensitive and sensory experience, creating an autopoiesis, that is to say, a system capable to self-produce continuously, while formulating an identity and a presence different from those of its environment. Christina, an artist-archaeologist, who by a method and a technique similar to those of an archaeologist, unearthing questions, digging, in search of her paintings and past elements, has undergone the test of time and presents her works in another time, the actual time. The artist’s works, real traces of a singular experience, bearing the scars of a certain duration, context, an atmosphere, are an invitation to a pictorial contemplation of another registry, that of marks of experiences obtained by the artist, as an invitation to share the artistic world of Christina and her relationship with the world.